Zion Market Research has published a new report titled “Industrial Hand Tools Market by Product Type (General Purpose Tools, Metal Cutting Tools, Layout & Measuring Tools, and Taps & Dies) and by Sales Channel (Online Sales, Retail Sales, and Distributor Sales): Global Industry Perspective, Comprehensive Analysis, And Forecast, 2018–2025”. According to the report, the global industrial hand tools market was valued at USD 9.85 billion in 2018 and is expected to reach USD 13.05 billion by 2025, at a CAGR of 4.1% between 2019 and 2025. Industrial hand tools are widely used in construction, automotive, and manufacturing industries. There are several types of industrial hand tools, such as metal cutting tools, layout and measuring tools, and general purpose tools. These tools are used for cutting, measuring, fabricating, screwing, etc. Industrial hand tools are widely available in the market and are supplied through distributors, online, or through retailers. The global industrial hand tools market is predicted to grow rapidly over the forecast period, due to the increasing demand from the construction and automotive industries. Moreover, the large-scale awareness regarding labor safety and ergonomics is anticipated to fuel the global industrial hand tools market growth in the years ahead. However, the oscillating costs of raw materials may restrain the market in the future. Alternatively, the expansion of e-retailing is expected to offer new growth opportunities in the industrial hand tools market in the future. The global industrial hand tools market is classified based on product type and sales channel. Based on product type, the industrial hand tools market is divided into metal cutting tools, layout and measuring tools, general purpose tools, and taps and dies. General purpose tools dominated the market in 2018 and are projected to continue its dominance throughout the forecast period as well, owing to rising product demand for commercial and residential construction activities. Moreover, metal cutting tools are expected to grow at the fastest rate over the upcoming years. Based on the sales channel, the global industrial hand tools market is segmented into online sales, retail sales, and distributor sales. The online sales channel is expected to register the highest CAGR over the forecast timeframe, owing to the growing demand for the e-commerce platform. Regionally, Europe and North America are the largest regional markets in the global industrial hand tools and held major shares of the global market in 2018. This can be attributed to the rapidly expanding construction industry, which is propelling the demand for advanced tools. Additionally, the rising focus on infrastructural development by the governments is likely to further enhance the growth of these regions’ industrial hand tools market in the future. 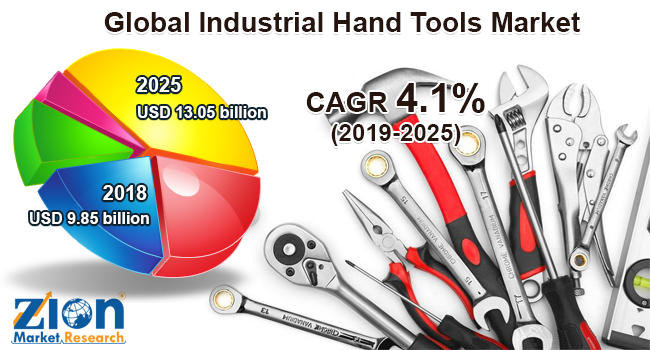 Some key manufacturers of the global industrial hand tools market are Snap-on Industrial, Klein Tools, Xinapse Systems Ltd., JK Files (India) Limited, Stanley Black Decker, Siemens Healthineers, Toshiba Medical Systems Corporation, Akar Tools Ltd., Mirada Medical Limited, Mim Software, Inc., Sciencesoft USA Corporation, Kennametal Inc., Channellock, Inc., Apex Tools Group, and Wera Tools.